Few months ago I bought a “roccolo” with a huge forest in Astano, a small village close to the Italian border west of Lugano and known for its gold . A roccolo (in German: “Vogelfangturm”) is a small tower which was used to hunt birds until 1875 when a Swiss federal law forbid this practice. The first roccoli were built around year 1300 by monks near Bergamo and spread also in Ticino. Today they are almost all ruins. The roccolo of Astano appears in the book “Roccoli del Ticino” of Giovanni Bianconi  and in the study “Das Malcantone”  of the University of Basel which provide an excellent documentation for brining it back to its original glory. The roccolo is nearly intact, but it requires a new roof and new floors. Local carpenters proposed to import the wood from Sweden or Russia, but… why not taking it directly from the chestnut forest around it as people would have done few centuries ago? I do not need crack-free beams. On the contrary, a rustic touch is more than welcome. 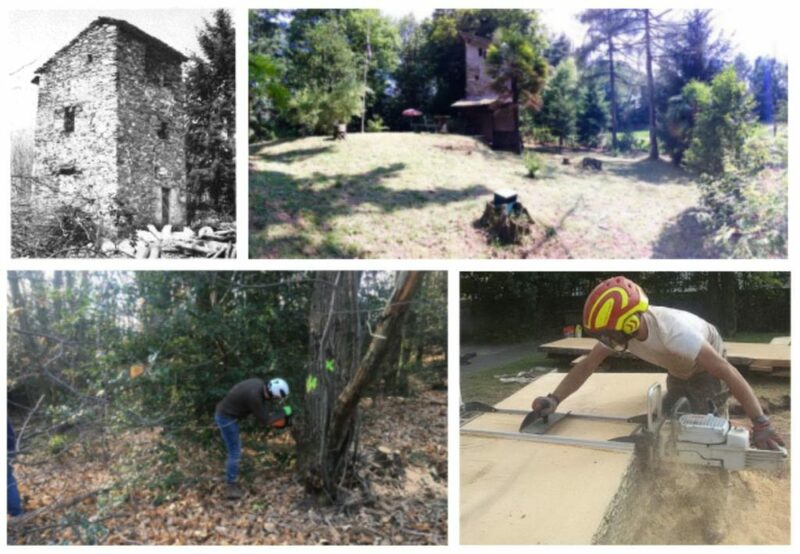 It was a beautiful surprise, therefore, to discover that in the neighbouring village (Sessa) there is since a few years a “mobile sawmill”, http://boratt.ch, which has all the necessary equipment to cut trees into planks directly on site. Winter is an ideal time for cutting construction trees because of the reduced metabolism. So two days ago, after receiving forestry’s permission and calculating the volumes with boratt.ch, I finally could cut thirty logs which will dry for a few months before being squared or cut into planks.